Senior Salvador Brito of Oxnard received the award from the 2015 Howard Hughes Medical Institute Exceptional Research Opportunities Program. (HOUSTON – June 3, 2015) A California Lutheran University student is researching muscle and neuronal development at the Baylor College of Medicine this summer as the recipient of a prestigious fellowship. 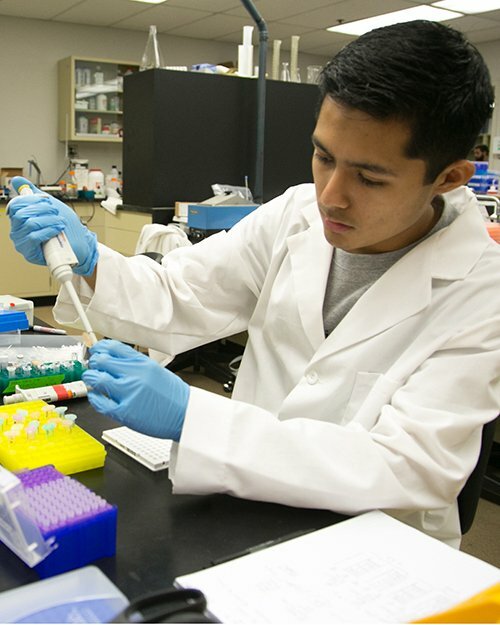 Senior Salvador Brito of Oxnard received the award from the 2015 Howard Hughes Medical Institute (HHMI) Exceptional Research Opportunities Program. It covers his travel and housing and provides him with a $5,000 stipend. The program provides undergraduate students from disadvantaged backgrounds and groups traditionally underrepresented in the sciences with significant summer research experiences. HHMI scientists volunteer to mentor the students in their labs during the summer. Brito arrived May 22 at the lab of Hugo J. Bellen, an HHMI investigator and director of the developmental biology program at the Houston medical school, and will work full time through Aug. 1. Bellen uses common fruit flies in his research because their biological processes provide clues about the aging process in humans. Researchers in his lab study how neurons acquire their identity, communicate with each other and ultimately die in order to better understand neurodegenerative diseases such as ALS and Parkinson’s. Brito and the other students conducting research throughout the country will present their findings during two meetings at the institute’s headquarters in Maryland. A biochemistry and molecular biology student who is pursuing a double major in psychology, Brito received Cal Lutheran’s gold award for the research he conducted last summer at the university. The Channel Islands High School graduate deleted quantified particular genes in human cells infected by hepatitis C virus to determine differences in protein expression levels among uninfected and infected cells. In May, he was named to the university’s Scholastic Honor Society, which is a select group of upper division students who have maintained a grade point average of at least 3.9. Brito, who was born in Mexico, served as the president of the Circle K service club at Cal Lutheran for the 2014-2015 year. Since 2003, the HHMI program has provided about 730 undergraduates with research opportunities. Staff members continue to work with and encourage the students after the summer programs end. The goal is to ensure that a diverse and highly trained workforce is available to assume leadership roles in science.